Four years ago Joni Mitchell's voice fell silent to the world, the victim, with her body, of a brain aneurysm. Mitchell turned 75 last November. A tribute concert was held over two nights in her honour. A film of the shows was given limited release in American cinemas in the past few days. A CD of the shows, Joni 75, will be released next month. Tributes for Mitchell are not new, but this one has an added poignancy dipped as it is in a pool of the celebration of the 75th birthday milestone and the personal tragedy that befell Mitchell in 2015. She attended these latest shows in a wheelchair, and though looking regal, and alive, she was fettered to a wheelchair, she didn't speak, and had to be helped to stand during the last song, a chorus-line rousing rendition of her hit Big Yellow Taxi. Those artists were Brandi Carlisle, Glen Hansard, Emmylou Harris, Norah Jones, Chaka Khan, Diana Krall, Kris Kristofferson, Los Lobos, Graham Nash, Seal, Rufus Wainwright and James Taylor. The concerts could not tell the full story, but they illustrated the spark with which she courted us. A Case of You, All I Want, Amelia, A Strange Boy, Blue, Borderline, Both Sides Now, Court and Spark, Coyote, Don't Interrupt the Sorrow, Down to You, Dreamland, For the Roses, Nothing Can Be Done, Raised on Robbery, River, The Boho Dance, The Magdalene Laundries, Two Grey Rooms and Woodstock. In the liner notes to the concert, fans write of the impact of Mitchell's music upon them. 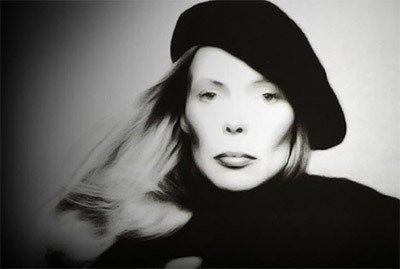 Fans such as Meryl Streep: "It's difficult to separate out the influence Joni Mitchell had on my life as a woman, so entwined is her voice in my personal history, the most intimate moments of it: how her music defined the very feeling of being alive for me, for oh these many years. I have often thought, I wish I could thank her, but there isn't a big enough word for the real gratitude I feel. Hers is a necessary artistry. I wish I could thank her mother and father for bringing this incomparable artist into being 75 years ago. What a good idea that was." Fans such as Rosanna Arquette, Chrissie Hynde, David Crosby, Joe Walsh, Susan Sarandon, Buffy Saint-Marie, Laurie Anderson, Don Henley and David Byrne all expressed their devotion and gratitude. At one of the shows, Taylor said: "She is still, and always, Joni. That energy, it continues. She's a world treasure. I know she's a national treasure if you're Canadian - and you're absolutely right to be proud of her - but she belongs to the world." "Writers have difficulty capturing what is special about Joni's music because they tend, myopically, to focus on just one element - the lyrics, the exotic chords, the tunings, the melodies, her role as cultural or generational spokesperson, that smile. It is all of these together, and it is more. What's missing from most accounts is the way her music makes us feel: the evocative deep effect it has on us - not just while we're listening, but in the way those songs stay with us, sometimes for a lifetime." Everyone has a different starting point into her music. Some have been there from the beginning, others from the landmark Blue, others her move into jazz. Hers is not an infatuation to be dabbled with and then to be walked away from after the first glow has gone. She goes under your skin, travels into your heart and mind. Takes up residence. Remains. You're a lifer to her music. Mine began with The Hissing of Summer Lawns. I can't remember why this album, or how it came to be in my hands, but it was always there in my early 20s, and from there Hejira and Don Juan's Reckless Daughter, and then I worked backwards to the early classics, For the Roses, Court and Spark and Blue. Bizarrely, one of the first cover versions of a Mitchell song I heard was This Flight Tonight, covered by Scottish rockers Nazareth. The band's bass player Pete Agnew once recalled: "We used to listen to Joni as we were travelling round in the van. This Flight Tonight was a big favourite." And that's the thing, Mitchell's art cut through everything. It is the arrow that pierces the universe of all that doesn't matter to that art. She is no friend of the music business, is to put it mildly forthright in her views. The artist within will always compel one to be true to oneself. Otherwise, what is the life but a lie. Mitchell is the truth that speaks power to song. She is no liar. Hers is, as Streep, says necessary artistry. This article has been viewed 1,402 times since being added on February 6, 2019.